Life Savers? I don’t think so! 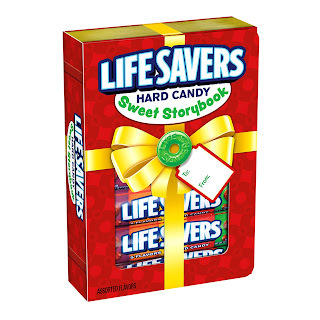 Every year, for many, many years, my mom and dad have always given me a collector box of Life Savers. This year was no exception. Along with the usual “nice” gifts, comes this little square, wrapped package that you simply look at a know…yep, thats them! This year I made a personal appeal to move away from the traditional Collectors Edition Life Savers to something that I would actually eat: Dentyne Ice Peppermint Gum. I knew that it would mean doing away with an age old tradition but I just felt like this was the year to make my pitch. I’m not sure whether it landed or not so I decided to take last years unwrapped Life Savers back to this years celebration and hide them in the tree for mom to find when they put the tree away for the year. In the meantime, I boarded my flight home only to be stopped by the TSA and have my carryon sequestered for a private “cavity search”. If that bag was a person it would have felt violated! As the agent unzipped the bag and started to “have her way” with it, she promptly pulled out…yes, you guessed it, this years Life Savers Collectors Box! She wiped it down, not sure what for, but it was serious. I said, what triggered you to search my bag? Was it the Life Savers? She said “yes, seeing the shape of these little cylinder candies, along with my iPad and New Balance running shoes, alerted them to go in deeper. After this invasive candy caper, she smiled, threw my items randomly back into the suitcase (not good for my OCD) and told me to have a nice day. There was no "Sweet Storybook" ending on this day:) So the next time you think about trying to fly home with a Life Savers Collectors Box, don’t pack it next to your electronics and your running shoes. Running with Life Savers while checking email on your iPad is dangerous! And if you are thinking that I am unappreciative, let me apologize. "Mom and Dad, I am so grateful for the annual cylinder shaped hard candy collector box. I want to bless the grandkids and ask that you make a donation of my candy to them for the future. And if you still wish to make me smile, go ahead and add a little 60 count bag of peppermint goodness known as Dentyne Ice gum in my stocking. I love you so much!"